This week during its developer conference, the company unveiled a grand strategy to break the stalemate. It announced a plan to deliver what’s known as the “Holy Grail” of app development: write the app once and it runs on everything, Windows 8 devices, Windows Phone 8, Xbox, iOS and Android. Microsoft’s plan consisted of lots of new development software, updates to existing software and new features in its app-hosting cloud Azure. Plus, Microsoft also launched a new software foundation that will bring even more “Holy Grail” tools to app developers, for free. Building UX: Multi-Device Hybrid App interfaces can be built using various open-source front-end frameworks such as Angular, Bootstrap, Backbone, Underscore, and WinJS (samples will be made available at TechEd). Debugger: Set breakpoints, inspect performance issues, analyze memory usage, and perform other debugging and diagnostics tasks on Android 4.4 and Windows Store. iOS – Remote Agent: A remote agent can be used on a Mac to enable building for iOS right from Visual Studio. The agent can also launch the iOS Simulator on the Mac. Integrating with Services: Microsoft services that speed up development for mobile apps can be integrated into these apps through the Service Manager and NuGet. 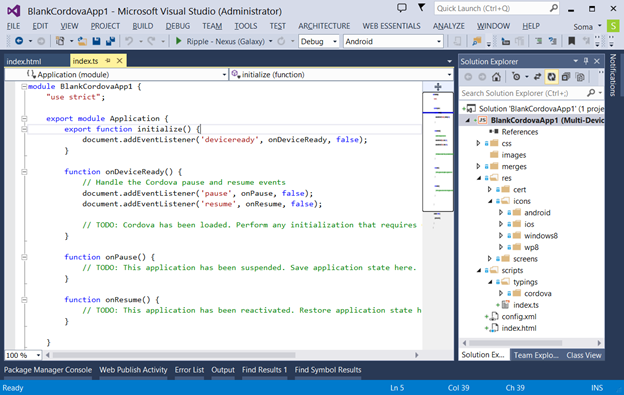 Projects can be built, deployed, and debugged directly in Visual Studio against a variety of devices, device emulators, and Web-based mobile simulators. The default option is to use the Apache Ripple simulator to test your application in the browser before deploying to a device. 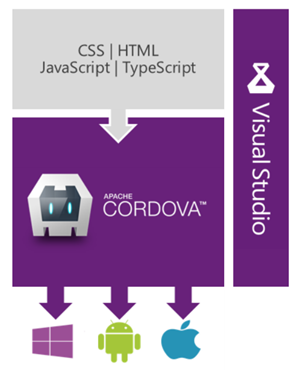 Microsoft seems most excited that developers will be able to use Visual Studio to develop, test, and launch a Cordova app directly on an Android device or iOS device. The company isn’t hiding that its goal is to turn Visual Studio into the best tool for creating multi-device apps across Android, iOS, Windows, and Windows Phone. Microsoft already offers the option of native apps powered by .NET and Xamarin, but now it is also pushing into the world of standards-based development provided by the Apache Cordova platform to further its push for helping build apps that share a large amount of code across devices.